© 2014 by Sarah Pinsker. On the nights Mrs. Wainwright let me work in the barn instead of the tavern, I used to sing to the horses. They would greet me with their own murmurs, and swivel their ears to follow my voice as I readied their suppers. That was where Captain Smythe found me: in the barn, singing a song of my own making. I shut up as soon as I heard the door squeal on its hinges. “You’re Freddy Turlington’s boy, aren’t you?” His voice was rummy but not drunk. There were men around I felt the need to hide from, but he didn’t seem like one of them. I watched him from one of the stalls. He sat down heavily on a bale of bedding straw, grunting as if the effort pressed all the air from his lungs. He wore a well-fitted blue coat and his boots still shone with care, which set him apart from most of our patrons these days. That one didn’t really have an answer, so I left it. I climbed up into the loft, dangling my legs over. He looked up at me. His face was red, but less from drink than from exposure, as far as I could tell from the uniformity of the color. His skin had the look of leather left out in the sun. I wished he would get to his point, whatever it was, but he was in no hurry. He closed his eyes. I thought for a moment he had fallen asleep, but then he addressed me again. It didn’t take intelligence. There wasn’t a person in Dog’s Bay who hadn’t heard about the sirens now nesting on the headland, singing at anyone who tried to pass, keeping ships from getting in or out. The streets and the taverns and the boardinghouses were all clogged with sailors, who were in turn clogged with their desire to be back on the sea. It was part of why I felt so much safer in the barn. The Salt Dog tavern became rowdier with each passing night. Fights and fires would come next, according to Mrs. Wainwright. She said she was old enough to have seen it all before. “What about sirens?” I had asked her. Everyone in port had an opinion on how to get past the sirens. In recent evenings past, clearing tables, I had heard debate after debate on the matter. Lucius Nickleby had been the first to try to leave. He and his men had stuffed their ears with beeswax, the way the Greeks had done. John Harrow watched through his spyglass on shore as they threw themselves from the deck. Ahmed Fairouz, with his fluyt Mahalia, had attempted to outrun the bewitching songs. The Mahalia was dashed to splinters on the rocks below the promontory. A month later, pieces were still washing to shore with each tide. “You understand what I’m proposing, boy?” Smythe asked. “As you were meant to do,” I echoed, emphasizing the “you.” His chosen destiny, not mine. Not that I had any reason to expect a choice. If Mrs. Wainwright wanted to sell or rent my bond, she had every right. Then again, I liked that Smythe had come to me as if it were a question. I liked the idea of seeing something beyond Dog’s Bay, even if only briefly. I had never considered myself an heir to my father’s wanderlust, but maybe some small sliver of it in me begged to be entertained. I wanted to see how the ocean differed from the cove, and why it called to all of the men of our town as persuasively as any siren. “If you’ve already spoken with Mrs. Wainwright and she’s said I’m to go, I’ve no business saying otherwise.” His rough hand dwarfed mine when we shook on it. I waited until the next day to seek out Mrs. Wainwright. I found her overseeing the morning meal, making sure the twins ladled each customer exactly the right amount of porridge. She rarely cheated a patron, just made sure they got what they had paid for and nothing more. It had taken a long time to get the twins to understand that nuance; now, at seven, they needed only minimal supervision. I waved a greeting. Eliza waved back, but Simon was clearly using all his attention to make sure the spoon got to the bowl and back without making a mess. “His idea is better than anything the rest of these fools came up with. Silas Hill—that fellow in the far corner—he’s trying to work up the dash-fire to make himself deaf, if he can figure out how. Only he’ll have to deafen his whole crew as well, won’t he?” She made sure Silas Hill heard her. He stared into his ale. “So you’re trying to kill me. You want me out of here. Sold to the highest bidder.” I swiped at a sticky spot on the bar with my rag until she stopped my hand. I looked over to see that the twins had managed to knock over the vat of porridge in their own direction. They were working together to right the pot, but wearing most of the dregs. They followed me outside. Simon’s left foot squished as he walked. Step, squish. Step, squish. Even in my dark mood, I found it hard not to laugh. “Fetch two buckets each,” I said, sliding the barn door open wide enough for them to wriggle through. They returned a moment later, and we went to the pump. I took pity on them and carried two back myself, leaving each of them with one full bucket. Sometimes two is better than one, though. Balance. Eliza lost half of hers on the walk back, most onto her own shoes and trousers. Simon trailed us, careful not to spill a drop. The day was mild enough, so I poured the four buckets into the barnyard trough. They did as they were told. “Now into the trough with you ducklings.” They both hesitated, then Simon shrugged and climbed over the edge, and his sister followed with a whimper. I slipped into the barn to give the shoe-porridge to the little chestnut mare that wouldn’t drink. When I returned to the barnyard, I heard the twins bickering. Eliza sounded more put upon, so I suspected the accident had been her fault. They were both still in their clothing, but I figured that needed washing, too. I had been in charge of their baths and their nappies from the time they had arrived, when I was seven. The smooth cleft between Eliza’s legs and the nub between Simon’s taught me everything that I was supposed to be and wasn’t. I suspected later that was part of the reason Mrs. Wainwright had put me to the task. “Why?” I asked the first time she showed me how to clean each of them properly. The cat in question unlatched box stalls and unscrewed jars. She did pretty well for herself. “It won’t bother me neither,” I echoed. I looked at the two babies. Up until that point I hadn’t really thought about it either way. It didn’t seem to make much difference. “I can be a boy.” More than anything, I wanted to please her. I was rewarded with a smile. I nodded, bouncing Simon on my knee. He giggled. I made a face, and he copied it. That would be how I would learn, too. I draped the wet clothing over a rail to dry, and bade the two naked children to sit on an old blanket while I cleaned stalls. “Why do you sing to the horses?” Eliza asked, tucking in her toes to stay clear of my wheelbarrow. I dumped the barrow outside, then joined my voice with theirs as I hoisted my pitchfork again. By the time I finished all fourteen occupied straight stalls and the two boxes, the sun was well past noon. I much preferred the horse waste to human waste, but most of the guests would be out by now, and chamber pots needed emptying. The twins levered themselves into clothes half-dry and stiffened in the sunlight. I crept closer to the source of the sounds, staying up against the buildings in case it was a fight. Silas Hill, who looked to be even more in his cups than he had that morning, stood on the edge of the old well. Hill swayed as he talked; he was probably lucky the well had been bricked over when the pumps were installed. The crowd murmured and swayed with him. They sounded like they agreed on the sentiment, even if they couldn’t put an actual number on it. She blushed, and I looked down. We both knew it was possible to climb up to the headland, and to sit in the rocky meadow and watch the ships come and go, and to share a single kiss before scrambling back down with our hearts hammering out of our chests. We hadn’t spoken of it since. The idea of killing them wasn’t one I had heard before. I knew the seamen needed to get back out to sea and that we needed supplies to come in. Still, I had figured the sirens would find some other place to nest at some point, and leave us alone. Or Captain Smythe’s idea would work, and ships could get by again. I wasn’t sure it was fair that they should have to die for doing what was their nature. Ginny and I watched as Hill rounded up eleven men, all as drunk or drunker than he was. “Cowards!” he shouted at the rest. None of them seemed to mind. Somebody put a rifle in his hand and he swung it like a sword. Another man raised a bow and a handful of arrows. The group stumbled down the cobblestones in the right general direction. A couple of snickers came from the larger crowd. “Bunch of suicides,” said a woman standing at the back. I saw Captain Smythe at that moment, facing me from the other side of the well. He had heard the other man too, but he caught my eye and shook his head. He believed in his solution. The others had too, of course. I threw an apologetic glance at Ginny as her mother marched me away. Had she noticed the way her mother said “boy”? My cheeks burned. “What have I said about speaking to my daughter?” she whispered when we were out of Ginny’s earshot. I wondered what the type was. In this town, her choice was pretty much one of the seafaring men or me, or one of the island’s few inland farmers. Maybe she was waiting for some rich merchant to roll in and whisk Ginny away to a better life. It wouldn’t happen so long as the sirens had us locked in and the world locked out. Somebody stumbled out of the Salt Dog at that moment, and I took the opportunity to squirm from Mrs. Arietti’s grasp and duck inside. For the next minute my breath came in gasps as I waited for her to follow. The tavern was full that night and the next, and for once I was grateful to have no time to think about anything but chores. Even the twins were called to duty. They kept busy fetching empties and unwatched half-empties, and giving us a running tally of what was going on in the corners we couldn’t see. The patrons fell into two categories, surly and morose. Nobody sang, nobody played card games. I broke up one fight, earning myself a black eye in the process, and Mrs. Wainwright broke up two more. She sent Simon and Eliza back to her rooms upstairs. Not long after, a sober and ragged-looking man slunk through the door. I recognized him as the one who had brandished the bow and arrows the day before. Someone at the closest table stood up to let him have a chair, and someone else handed him a mug of ale, which he drained in one draught. They grew silent. Another mug appeared in front of the man. He drank that one slowly, sighing when he reached the bottom. I expected a long story, but he didn’t have much to say. “How did you get away?” asked the sailor who had hit me a few minutes before. A laugh went round the room. “That sounds about right for old Charley,” someone shouted. “What did they sing?” Smythe asked, his voice cutting through the chuckles. I hadn’t even realized he was in the room. “That’s no lie,” someone shouted from the back of the room. More laughter. “Not the tune, then. The words? Anything?” Smythe’s voice held no humor. Someone launched into “Married to a Mermaid,” and for the first time all night the customers sang. Mrs. Wainwright joined in, and I would have liked to, but I made sure not to sing where strangers might hear. I noticed Captain Smythe wasn’t singing either. He pushed his way through the crowd to talk to me. The mood in the tavern brightened. Mugs were raised to Old Charley and to Silas Hill and the other dead men. “We’re leaving in the morning,” I told Mrs. Wainwright. “Feed the horses before you go, then, and you’ll be back to feed them again come evening.” She turned away from me quickly, but not before I noticed tears in her eyes. I slipped upstairs to her rooms, where Simon and Eliza were playing jacks on the floor. I sat down beside them. “Do we have to do your chores if you don’t?” Eliza asked. “I imagine you do. But I’ll be back.” I tried to keep my tone light. I spent the night in their bed with them, and extricated myself from their little bodies at the first light of dawn, having not slept a minute myself. I went through my rounds in the barn, feeding and watering the horses, singing them “Married to a Mermaid,” and giving each an extra pat and scratch behind the ears. The chestnut mare had finally drunk. If we reopened the port, the knife salesman would be on his way, and she could go home to where she liked the water better. If we reopened the port, I’d be back here to see her off. I tried not to think about the other option. Captain Smythe met me at the docks. I had expected a crowd, but I was happy to see only his own men had gathered to see him off. I wasn’t much for attention. I only wished Mrs. Wainwright had come. Maybe the previous night was as much goodbye as she could stand to say. I knew she cared about me, even if she didn’t say it outright. Smythe’s rented fishing boat was as small as he had said, though it had a small cabin and sails. He was chatting with his men, so I jumped on board and began looking over the rigging, to show him I knew a little bit. Not that I knew much. I had only sailed around the bay now and again with some friend or another of Mrs. Wainwright. One had actually taken the time to teach me. “It’s not right to live in a port town and not know how to sail,” she said. So I checked the lines and the cleats, and felt pleased with myself. Smythe joined me a few minutes later, with one last wave to his men. I imagined he had charged them to watch and report back if we didn’t return, or to serve as our witnesses if we made it back and nobody believed us. He cast off with practiced hands. I left him alone while he worked. When he finally addressed me, he did so without looking in my direction, pointing to a heavy iron lock on the outside of the cabin and a key on a hook beside it. “You’re not to let me out, no matter how much I beg. Not until we’re out of the bay.” I nodded again, and watched as he lashed the tiller to hold direction. He didn’t say another word, but gave an ambiguous gesture in my direction as he went below. Goodbye, perhaps, or good luck, or don’t wreck us, or just get on with it. I closed the lock and hung the key back on the peg. I had never been alone on the deck of a boat before. It felt strange to sit at the tiller as if I were a captain. Powerful. How much more so would it feel to succeed in our task? Maybe if I returned a hero, Ginny’s mother would let us speak again. A mast stuck out between the rocks. Here and there, pieces of other ships that had preceded us. Ahead lay the mouth of the bay, wide and glittering gold-blue where the morning sun hit the water. The two rocky promontories that sheltered us loomed taller than I had ever seen them before. The one to the starboard side was the one I watched now. I didn’t know what to expect. Would the sirens appear? Would they sing first? What did it feel like to be lured by a song, lulled by a song? What went through the heads of the captains as they dashed their own ships on the rocks? I wanted to know. I didn’t want to know. There was a decent breeze by the shore, but it lessened as we sailed toward the open sea. I hummed to myself to pass the time. The air now hung like a woolen blanket on a washline. I took my hand off the tiller; I was only pretending to be a captain. Really, I had no clue what to do if we were becalmed. He moaned in response. I scanned the rocks for any sign of the sirens. Their voices were hideously beautiful. I made out some of the words. As Old Charley had said, it was a song about the song itself, daring the listener to listen, as if anyone had a choice. The words drifted in the air. “Listen to our two voices,” they said, and I did. “Sweet coupled airs we sing,” and something about a green mirror, and the whole time they were singing, I kept expecting some key to turn in my own lock, something to make my hand move on the tiller. And the whole time they were singing, I kept thinking: I know this song. I knew it in my bones, knew it though I had never heard it. Not the words, but the challenge behind them. The sail moved of its own accord, fighting any direction. A new wind swirled, pushed about by the force of enormous wings. Wings that blocked the sun and sent the boat rocking. The sirens landed on the deck, feather-light, and I saw them for the first time. They were like me. Or I thought they were, for a moment of wishful thinking. They weren’t, but I found it hard to look at them straight on. They were naked, and they had wings, or they didn’t, and they threw their shoulders back and their chests forward like strutting birds. I understood the two voices, understood the mirror, understood. Smythe still moaned in the cabin, but with luck the tide would bring the boat safely to shore even if I didn’t return. His men could pry the door. I took off my shirt and unwrapped the binding round my small breasts. I removed one boot, then the other, then my trousers. I dared them to look at me, and they did it as if it wasn’t a dare at all. Like nothing I had ever wanted in my life, I suddenly knew I wanted to grow wings and scales. I wanted to roost with them on rocks in their green meadow. No. What about Mrs. Wainwright and Captain Smythe? Roost with the sirens in some other green meadow, overlooking some other sea. Teach them new songs that didn’t sing sailors to their graves. I am not a man, some small part of me said. I am but I am not. But the female captain had run aground as well, and I knew I wasn’t exactly a woman either. While I puzzled, each of them took one of my arms. They lifted me into the sky. I squeezed my eyes shut. It took me a moment to work up the nerve to look. Everything appeared much smaller viewed from above. I saw the shape of the whole island, the rocky cliffs that made any other landing impossible. The bay really was shaped like a dog’s head, pinched by the collar of the two headlands. Our town, the dog’s snout. I saw the town square, and the tavern, and the barn, where I had sung only to horses. I pictured Mrs. Wainwright starting the porridge, and the twins stirring in their bed, and Ginny’s lips on mine, and I missed them all as if I was already gone. “Wait,” I said. What belonging could the sirens offer me? I wasn’t one of them. Whatever they were offering wasn’t love, or furtive kisses, or even the satisfaction of a job done well. If I went with them, what would Mrs. Wainwright think of me? The choice overwhelmed me. I wasn’t sure if it even was a choice. Maybe I was already another sailor lost to the sirens. I didn’t know what else to do, so I sang. The sirens closed their mouths and listened as I sang their own song back at them, and then shifted the tune to one of my own, keeping some of their words. Their two voices? I lived that story every day. They sang that no life could be hid from their dreaming, so I offered mine as proof. I thought maybe they had never heard a creature such as I was: alone in my knowing, alone of my kind. I sang another song, turning their mirror back on them. “But we can tell you everything that will ever happen in the world. All the secrets.” Their voices had lost some luster. The sirens dropped me over open water. I might have taken that for a kindness, but it didn’t feel intentional. By the time I hauled myself onto the boat, they were specks on the horizon. Someone else’s problem. I lay naked for a moment on the deck, basking in the bright sunlight. Then I clothed myself and unlocked the cabin. The horses would be waiting for me, swiveling their ears to catch my song over top of the breeze that would bring our small boat back to shore. Sarah Pinsker is the author of the novelette In Joy, Knowing the Abyss Behind, winner of the 2014 Sturgeon Award and 2013 Nebula Award finalist, and 2014 Nebula finalist, A Stretch of Highway Two Lanes Wide. Her fiction has appeared in Asimov’s, Strange Horizons, Fantasy & Science Fiction, and Lightspeed, and in anthologies including Long Hidden, Fierce Family, and The Future Embodied. She is also a singer/songwriter and has toured nationally behind three albums; a fourth is forthcoming. In the best of all timelines, she lives with her wife and dog in Baltimore, Maryland. 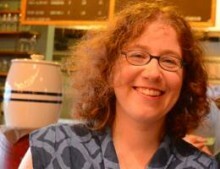 She can be found online at sarahpinsker.com and on Twitter @sarahpinsker.